Equity markets in China continue to lead this year's across-the-board gains around the world. Feeding into the bullish trend is encouraging economic reports for China published today, along with fresh optimism that a trade deal for the US and China may be near. Analysts attribute China's upbeat Q1 data to the government's decision to support growth with additional monetary stimulus. Equity markets in China continue to lead this year's across-the-board gains around the world, based on a set of exchange-traded funds that represent the major regions and markets. Feeding into the bullish trend is encouraging economic reports for China published today, along with fresh optimism that a trade deal for the US and China may be near. The iShares MSCI China ETF (NASDAQ:MCHI) is up a strong 23.0% so far in 2019 through yesterday's close (April 16). The fund's rally this year is well ahead of the second-best year-to-date gain via US stocks: SPDR S&P 500 (NYSEARCA:SPY) is up 16.6%. Several economic updates for China offer support for the run-up in stock prices. Beijing reports that economic output stabilized in the first quarter. The country's gross domestic product increased 6.4% vs. the year-earlier level, matching the pace in the previous quarter. Meantime, factory production grew 8.5% in year-over-year terms (well above expectations) and retail sales increased 8.7% vs. the year-earlier level, marking an acceleration in consumer spending. Analysts attribute China's upbeat Q1 data to the government's decision to support growth with additional monetary stimulus. "This time they used an overwhelming amount of force to boost the economy," says Larry Hu, chief China economist at Macquarie Group. "That is why the economy stabilized in the first quarter." He adds that "the recovery is not that solid. They front-loaded the policy firepower at the start of the year," which suggests that economic activity could weaken later in the year. 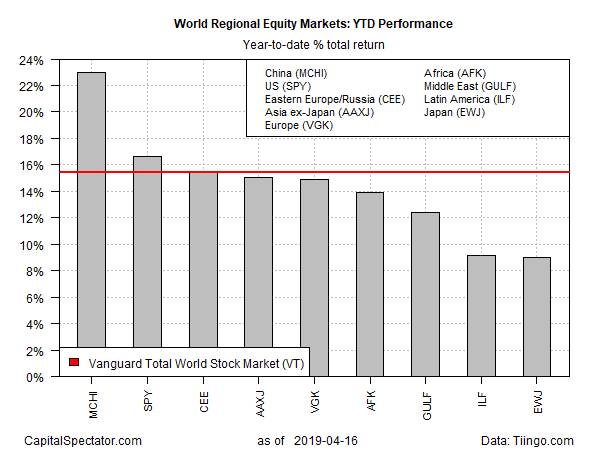 Global stocks overall are up a healthy 15.4% year to date, based on Vanguard Total World Stock ETF (NYSEARCA:VT). The ETF's rally this year marks an impressive rebound after last year's correction that left the fund with a full-year 9.8% loss in 2018. 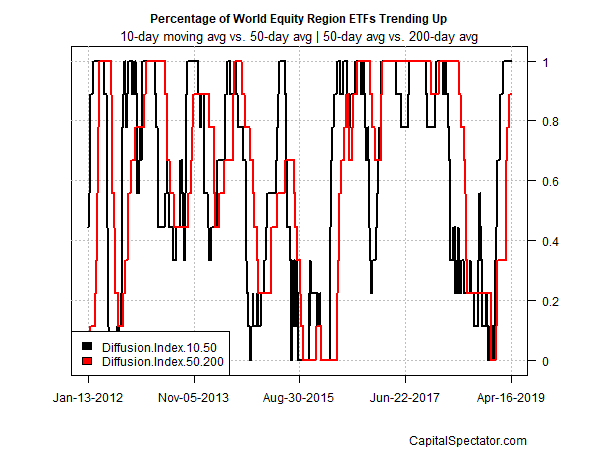 The strength and breadth of the global equity market's rally of late can be measured using two sets of moving averages for the ETFs listed above. The first definition compares the 10-day moving with the 100-day average, providing a profile of short-term trending behavior (black line in chart below). A second set of moving averages (50 and 200 days) offers an intermediate measure of the trend (red line). The indexes range from 0 (all funds trending down) to 1.0 (all funds trending up). Based on data through yesterday's close, bullish momentum remains robust in markets across the globe.